In their first-ever report on the economic costs of pollution, Chinese authorities say environmental damage cost the country more than U.S. $64 billion in 2004, but experts say the actual figure is probably far higher. China’s State Environmental Protection Administration (SEPA) announced Sept. 8 that pollution had caused losses of 511.8 billion yuan (U.S. $64.4 billion) in 2004, roughly 3.05 percent of gross domestic product (GDP) for the year, the official China Daily reported. The estimate, released by SEPA and China’s National Bureau of Statistics (NBS), marks the first calculation of “Green GDP” under a two-year-old program to assess environmental costs in terms of China’s gross domestic product. The Green GDP announcement appears to contradict an estimate in June by SEPA deputy director Zhu Guangyao, who said pollution costs China more than U.S. $200 billion yearly, or roughly 10 percent of GDP. The scale of the Chinese economy is enormous, as we know. And big industrial accidents have come to light in recent years, and damage to agricultural lands has resulted in big backlash protests in some parts of China, as we know. But we wonder about the stories that aren’t being told and the losses that are a little bit more hidden. Official reports aren’t stipulating what was included in the Green GDP estimate and what was omitted. For example, “environmental degradation” comprises “environmental pollution” and “ecological damage,” without further explanation. The study also appears to make no allowance for health care costs resulting from pollution. In interviews with Radio Free Asia, environmental experts praised SEPA for making a start on the Green GDP program but voiced concern at what was left out. “If they were to include those, they do say that the [estimated impact on GDP] would be much higher,” Davies said. In a widely cited previous study, a World Bank report in 2001 estimated damage from pollution in China as equaling between 8 and 12 percent of the country’s GDP. Davies pointed to the health impacts of pollution as a significant contributor to costs. The World Bank has estimated that 400,000 people per year in China die from pollution-linked ailments such as lung and heart disease. 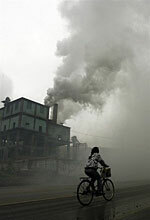 China “certainly can quantify the health costs of air pollution,” Davies said. Whether the SEPA report’s estimate of 5.7 billion yuan (U.S. $717 million) in costs resulting from “solid waste” and “pollution accidents” accurately reflects the annual damage caused by undisclosed chemical spills or other disasters is also unclear. On Sept. 4, for example, The New York Times reported that an entire village on the Yellow River in Inner Mongolia was destroyed and abandoned following the release of toxic water from two paper mills in April. The factories had been dumping directly into the river for decades, the paper said. Davies said the damage from such accidents may be incalculable. Three days after the Green GDP announcement was made, SEPA deputy director Pan Yue told a meeting in Beijing that more than 130 water pollution accidents had occurred in the Songhua River over the last 11 months, reports said. The river was the site of one of China’s worst chemical spills last November when a plant explosion in northern Jilin Province released 100 tons of toxic benzene and nitrobenzene into the water. Daniela Salaverry, China program associate at the San Francisco-based nongovernmental organization Pacific Environment, said the cost of such accidents likely exceeds the Green GDP estimates. “It’s hard to believe that the Green GDP [figure] is only 3 percent if you have pollution incidents happening every other day on only one of China’s seven major rivers,” she said. Controversy has surrounded the Green GDP program since May, when the London-based Financial Times reported that China had abandoned the project altogether. Since then, officials appear to have pressed ahead with the program. Whether the estimate released this month resulted from a compromise between SEPA and the NBS is unclear, Salaverry said.